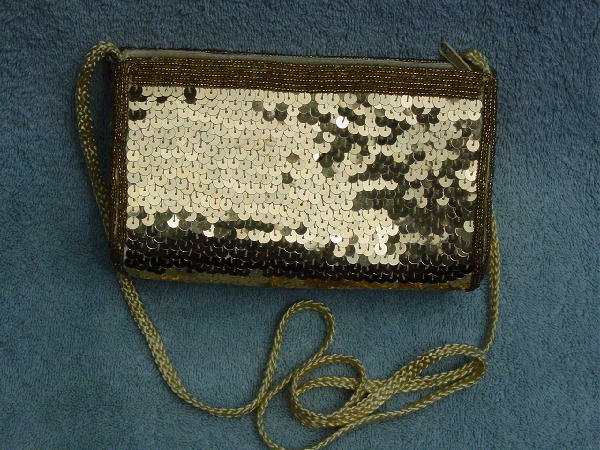 This gold sequined and beaded purse is by Dolce. There are 6 round tiny gold beads along both top sides and 3 rows along each side end. The remainder of the surface is covered in gold sequins. The top has a side to side zipper. It has a light lemon fabric lining and an open side pocket. There is a small age spot on the lining. It has a 46" long light lemon color woven cord shoulder strap and a top side to side zipper opening.